RIO DE JANEIRO - Tokyo 2020 Olympic organizers and Tokyo Gov. Yuriko Koike on Saturday vowed not to leave unused “white elephant” venues to the taxpayer after the Games have finished. “The citizens of Tokyo are the taxpayers, and we must have their understanding in whatever we do,” said Koike, who was elected governor on Aug. 1 and is currently in Rio de Janeiro preparing to accept the Olympic flag on Tokyo’s behalf at the 2016 Games closing ceremony Sunday. Preparations for the Tokyo Olympics have been dogged by accusations of overspending, with plans for the new National Stadium sent back to the drawing board last summer after the projected cost had almost doubled to ¥252 billion. Organizers of Rio 2016 have slashed costs with Brazil facing massive economic problems, leaning heavily on temporary arenas and venues that can be repurposed after the games have finished. Rio’s Future Arena, where the Olympic handball competition has been held, will be taken down and the parts reused to build four state-run schools in nearby neighborhoods. 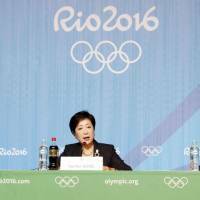 “What they did in Rio was a good reference for us,” said Tokyo 2020 CEO Toshiro Muto. “For the purpose of budget reduction in Rio, various innovative ideas were introduced. For us too, of course we have to reduce costs and not waste money. The organization of South America’s first Olympics has gone off relatively smoothly this month in Rio, although gridlocked traffic has caused serious delays for athletes, officials and spectators. “In Tokyo, the road lanes are very narrow,” said Koike. “That’s the reality of the situation and we can’t just expand the roads right away. Tokyo 2020 organizers will also have to contend with the extreme summer heat and humidity during the July 24 to Aug. 9 games. “We need to think about how we can ensure an environment that will enable people to endure the heat,” said Muto. “We are receiving various ideas from technology companies. For example, pavement technology can be upgraded to evaporate the heat and reduce the temperature. Or mist can be sprayed over the venues and athletes, or we can use more conventional ideas like greenery and planting trees. The summer heat could also affect the athletes at Tokyo 2020 if organizers follow the same competition schedule as some previous Olympics held in East Asia. The finals of the track and field events at the 1988 Seoul Games were held during the blistering afternoon heat to accommodate the wishes of American TV networks, and Japan Olympic Committee President Tsunekazu Takeda admits he is unable to make any promises for 2020. “I was the sports director of the Nagano Olympics, and at that time it was a very difficult point,” said Takeda. “This time the Tokyo Olympics are going to be staged in the middle of summer, so putting the athletes first has to be the priority. But at the same time, the air time for TV still has to be negotiated.